Just about, I need bottle cages for the forks and to put more junk up front. I loaned a few of my photos to these guys, check them out. The goal is to fight boredom. I used to have to watch Japanese cartoons(I was into that in college but not anymore), since they had something to watch, listen to, and read. I need all that to keep my mind active and to keep from getting bored. This time around I wound up watching science and space shows from the BBC. You'll need a few things. I broke it down to 5 hours with a break between each hour, and a nap after 3. It was not that boring or hard. Much easier and quicker than the first time I did it. 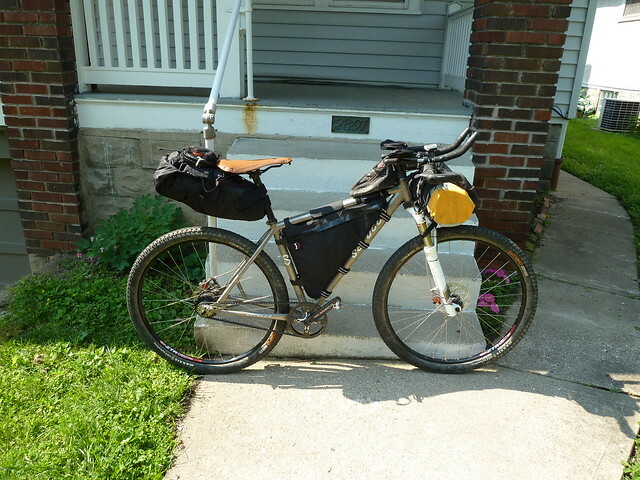 My new frame bag and saddle bag from Revelate Designs came in today. They are feature rich, I'll have to write about all that tomorrow. I made it to the campground around 3:30, a little later than I'd normally show up, but I had to stop in Vonore to pick up some parts for my truck. The campground was packed, but luckly Ed from the Team Ed reserved two spots. Setup camp and registered and then Cricket showed up with Andrea and Scott. We had dinner and I had a great night's sleep, first time outdoors since October. The next morning I found Gary, Dave, and Evan, and before I knew it, the race started(4 minutes early by my watch). I paced behind Ed for a bit, and Cricket and Scott caught me so we road up most of the asphalt until the last downhill. I think I got ahead of about 4 or 5 other people before the single track. I passed a few guys on the single track, and I didn't get passed, except by the top 3 65 milers. After a while my feet started hurting, I'm not exactly sure what the issue was; new shoes, new insoles, and taking it easy on the saddle, probably all added up to hurt feet. I stopped at aid station 2 to get new bottles(this is where I quit last time). Some time afterwards Cricket caught me; we road together as much as possible, she'd dust me on the climbs, I'd dust her on the downhills. The Serotta would absolutely fly down hill, much faster than the 26'r. Unfortunately it was pretty skittish around the loose gravel corners. I'm running the same tires on the Serotta as my 26'r, but they're narrower, and probably had too much air. The Crossmarks are my favorite, so I'll just have to deal with that on the TD. After a while I took out the arch support from the shoes, and then the metatarsal pad on the right shoe, but my feet still hurt. The rest of the race was uneventful somewhere before aid station 5 Ed caught and passed me at his steady pace. I caught Cricket at aid station 5, we did the next climb together, and then I never saw her. I was pretty gassed by then, and I walked a few of the gravel climbs and most of the single track climbs after that. Even with that I was still on pace to just squeak under 10 hours. My only complaint(besides aching feet) was that I put too much dry ice in my cooler and my chocolate milk was frozen.